We’ve already seen Google(s goog) Glass help out firefighters, sleepy drivers and interviewees. Doctors have been a potential user group based on wearing Glass during surgery and a preview program last year that suggested using Glass for patient history. Now that too is a reality at one hospital in Boston. According to Halamka, the patient data is never seen by Google, which I suspect would be a HIPAA violation. Instead, the prototype app was written so that all personal information stays behind the hospital’s firewall and is never sent to Google’s or anyone else’s servers. Glass may be ridiculed as an expensive piece of hardware that’s good for taking pictures, but software is what’s going to prove the value of a wearable computer. This is going to be one of the few ’embedded environments’ where glass will have some intrinsic value beyond being a fad consumer device. Looking at those cards, that already seems like too much information for Glass. 5 or 6 lines of text is about all I want to see on Glass before it becomes annoying to read. The screen is small, and it’s not in a comfortable place to look for a long time. You want to look for a moment, and then look away and go back to what you’re doing. QR codes…really? How about WIFI-based RTLS and Bluetooth LE proximity. Dr. Halamka does run a pretty tech-savvy operation and is very rare for a CIO in healthcare. 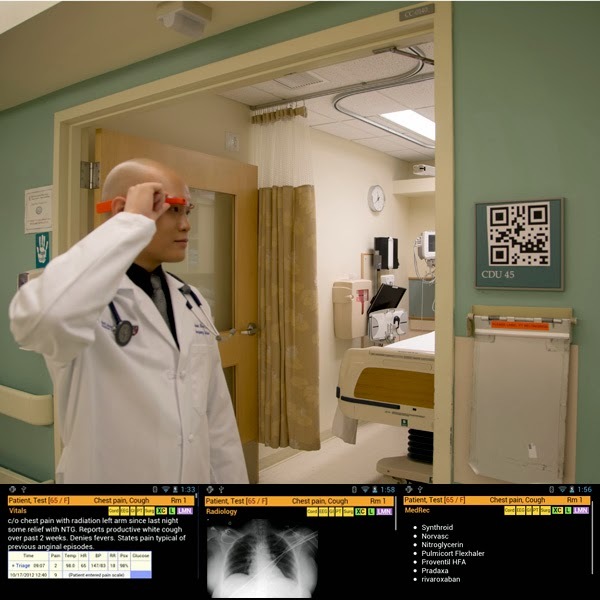 The real genius, I think, is the distillation of patient data from the EMR into useable format in Google Glass. Too often the human factors get in the way, and if a doctor has to go through pages of information, it could lead to errors. [If it is true] It indeed is rare. Having a Dr as a CIO can be very very good. But almost always, it is very very very bad. Keeping technologically competent takes a lot of effort. Doing that and keeping up with the medical world is super human. Most people can’t keep up with just one. And that defines the typical CIO. It would be too easy to pick up the wrong patient records. That’s far too dangerous in a hospital. Imagine someone getting the wrong drug that reacts with a drug they were already on. It’s vital that they have the right patient (Pun intended). My first thought at seeing the QR Code is that it should be on the patient’s bed or wrist, and not the room. I totally agree that there’s little/no room for mistakes. Glass (and other wireless devices) could make very effective use of Bluetooth LE (beacon) wrist tags on patients that provide immediate, near and far range/proximity data. To avoid mistakes Glass could present the wearer with sufficient data (such as a photo/s, etc.) to verify that they’re dealing with the correct patient and additionally require some form of acknowledgement. We’re already seeing widespread use of Wifi-based RTLS devices/systems that aid in patient and asset tracking and utilising similar technologies to deliver patient data in real time is a logical and practical next step.